Global models forecast the development of a long-wave, cold and intense trough at 500 mb that remains over the West for much of the first part of December. Shown here are the GFS ensemble means at 500 mb - above valid at 12 UTC December 2nd and below valid at 00 UTC December 7th. By days 6 and 7 as many as 8 of 12 GFS members are forecasting precipitation over the Southwest. Some of the members forecast a wet plume of subtropical air into this region - as per surface and precipitation forecast below, valid at 12 UTC on December 4th. Looks like an interesting start to the last month of 2013. No turkey served here today; we'll be having tamales later today. 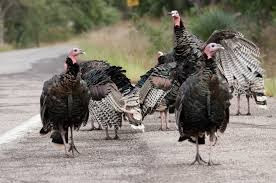 Arizona does have wild turkeys roaming over a considerable range across the grasslands and higher elevations. Last one I saw was over in the Gila Wilderness in New Mexico. None spotted along the Rillito during my 15 years of walking. I hope many readers will have the Holiday off, but I also realize that more and more people have to work today. 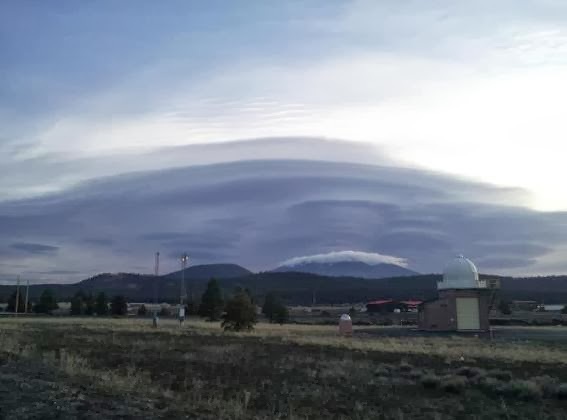 Many professions are 24/7, as is weather forecasting - above is from the webcam at Arizona's Flagstaff Office (the new office - in distance here left of the upper-air release building - is actually in Bellemont, west of Flagstaff). Our thanks to all who are working this Holiday. Final comment is that the country seems to be losing this Holiday, as more and more people in service and retail jobs are having to work, so that retailers can increase their sales of stuff. 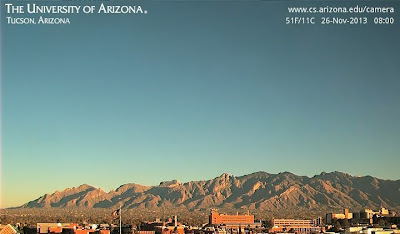 Yesterday was crystal clear for much of the day, until Pacific cirrus moved in during late afternoon. 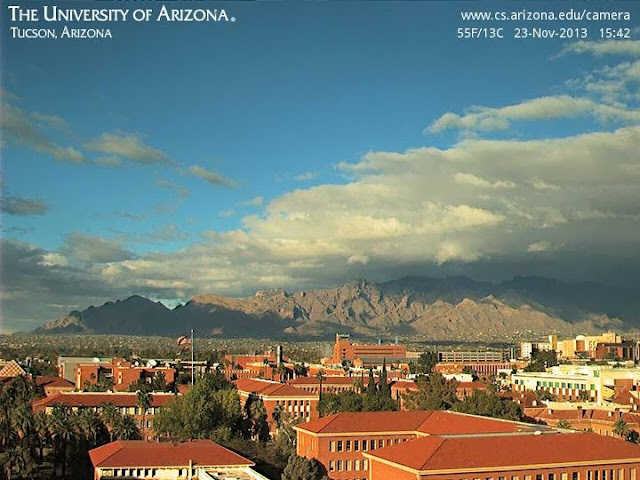 View above is at 8 am MST yesterday (Tuesday, November 26th). However this morning has dawned very dreary with skies completely covered with thick, high clouds - below is visible satellite image from 8 am Wednesday, November 27th. 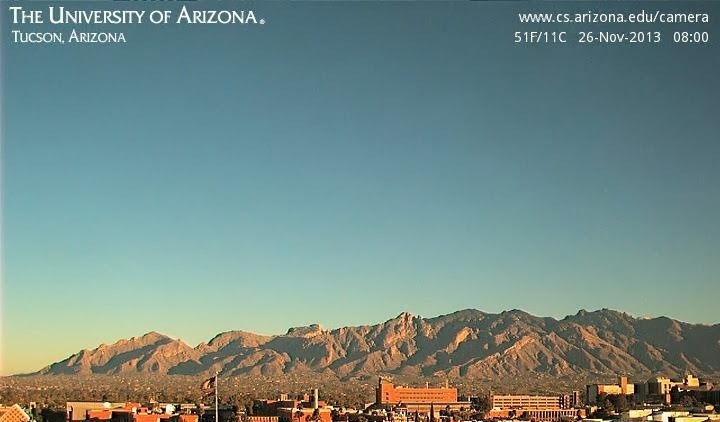 The view of the Catalinas at a bit before 8 am was much different than that yesterday (above). It has been windy now for about 24-hours, with frequent gusts above 30 mph - forecast calls that breezy but I call it windy. Wind was very strong along the Rillito when I walked this morning, and I chose a route that kept me sheltered as much as possible - not at all a nice morning. Table below shows hourly observations at the airport, since 7 pm last evening. Note that the cloud observations from the automated ASOS system are completely misleading, since that system indicates continuously clear skies through 8 am this morning. Was another cold morning along the Rillito before sunrise today. The low yesterday morning (Monday, November 25th) was 34 F here at the house and this morning it was 33 F. There was light frost both mornings on the grass at the park and at Karsten Turf Research Center - both right along the wash. At the airport this morning easterly surface winds set in around 2 am MST and the temperature jumped about 7 F - see airport time series above. So airport low was a fairly mild 43 F. The easterly winds broke through up here at about 8 am, with a similar jump in temperatures. Winds here are now fairly strong at 15 to 20+ mph. I checked the early WRF-NAM and it did a pretty good forecast of the east winds increasing and the mild temperatures - of course it doesn't resolve the very local cold air along the Rillito Bottoms. Water vapor image at 2 pm MST today (Sunday, November 24th) shows that the middle and upper-level low over the Southwest has evolved into an egg-shaped system, titled from southwest to northeast. Most of the significant weather with this system is now over the mountains or east of the Continental Divide. The event turned out to be the most significant of the year here at the house wrt to rainfall. Total was 2.09" falling as follows: 0.02" before midnight on Thursday night; on Friday an additional 0.71" had fallen by 5 pm; during Friday night through 9 am on Saturday another 1.10 inches fell; with final 0.26" coming by around noon, when the precipitation ended here. The event occurred across about 36 hours here at the house. But those 36 hours make this the wettest single event of 2013 and November easily the wettest month of the year so far. 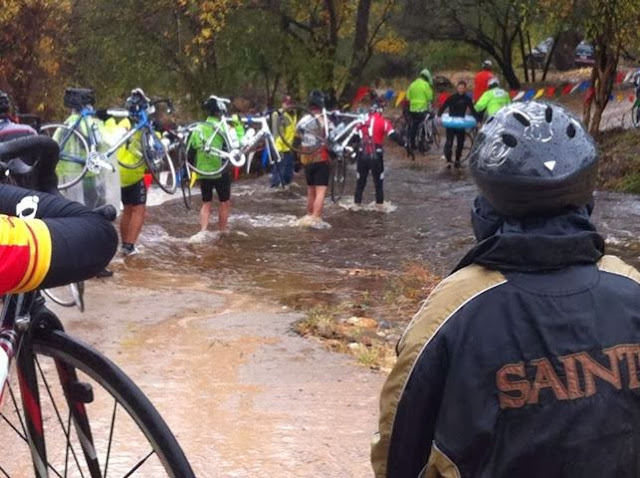 The el Tour de Tucson bicycle event was chaotic, with portions of the route flooding to varying degrees. Sadly, one bicyclist was killed when hit by a motorist. There was also one drowning here in Tucson in the Santa Cruz. Photo below was taken, I think, where race route crossed Sabino Creek. 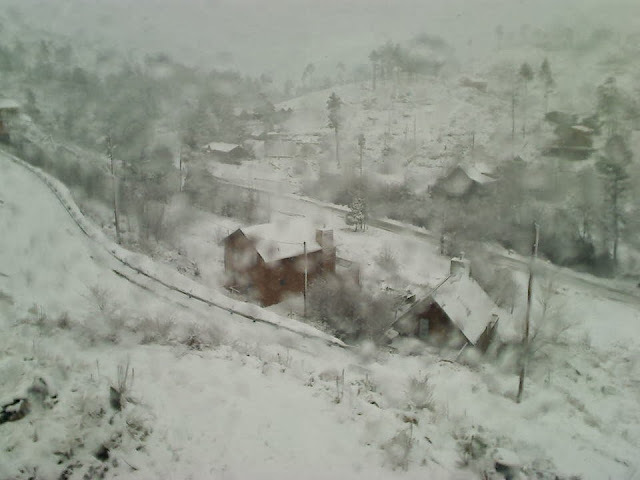 Webcam from Summerhaven up on Mt. Lemmon shows heavy snow cover at 2 pm MST this afternoon. Total here at house for entire event is just a tad over 2 inches. But some sunshine now here in town. Apparently the Ducks have not done well this afternoon - too many weather changes? 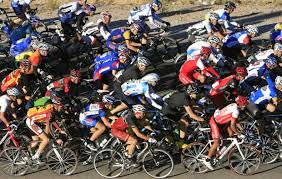 Today is the annual el Tour de Tucson, a 100+ mile bicycling race, that is supposed to start at 7 am MST. Rain continues across the metro area and this will be a far different race than in past years. Current radar (6:30 am) is shown below. Moderate rainfall occurring here at house. Later today the Oregon Ducks will be in town for football and they should be used to this kind of weather. that 59 of 92 sites have had more than an inch of rain; 9 sites have had over 2 inches and 3 have had over 3 inches. Mt. Lemmon has recorded more than 4 inches of rain. Amounts have been lightest in the southeast portions of the network. Shown here are three sectors with the 24-hour rains that ended at 6 am MST. I have not yet tried to read the gauge here this morning. Water vapor image at 13 UTC (above) this morning shows closed upper-low along coast near Los Angeles. Currently (also about 13 UTC) there are strong radar echoes on the Catalinas (below), but I have not seen any lightning flashes. 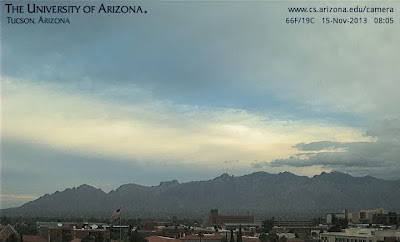 Early stages of the storm have focused mainly on the Catalinas here in southeast Arizona. At 6 am MST 41 ALERT stations had recorded rainfall for past 24-hours. 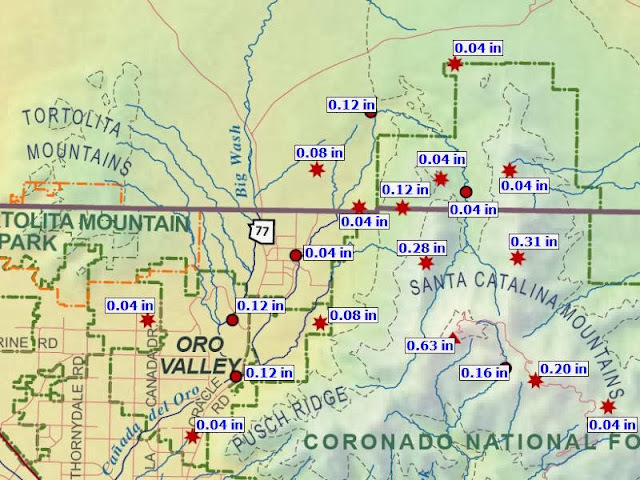 These reports have been mainly in the Catalinas and northwest part of the network. Two graphics here show the Catalinas (above) and Northwest (below) sectors of the network. Heaviest amounts have been over high elevations of the Catalinas. (Note that the ALERT gauges are not sensitive to low rainfall amounts, below 0.04", so coverage has been greater than indicated.) For example there have been 0.02" here and also at the airport. Across Arizona precipitation amounts have been substantial over the west and northwest half of the state. 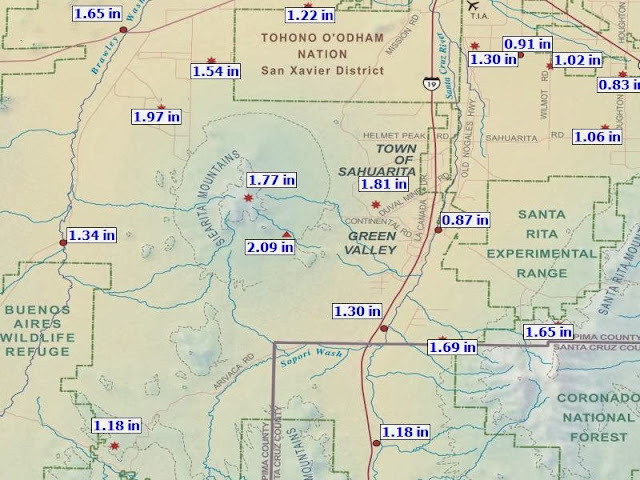 Both Phoenix and Scottsdale have measured over an inch of rain so far. Considerable thunderstorm activity also occurred from Yuma into the mountains northwest of Phoenix. The early WRF-NAM forecasts from Atmo this morning predict that the event will shift eastward over Pima County and extend south-to-north across the Tucson area after midnight tonight. Forecast of composite radar echoes above is valid at 3 am MST early tomorrow morning (November 23rd). Forecasts of the entire event (precipitation totals forecast through 11 pm Sunday night) are below and continue to indicate heaviest rainfall totals from western Pima County north-northeastward into the Rim Country. 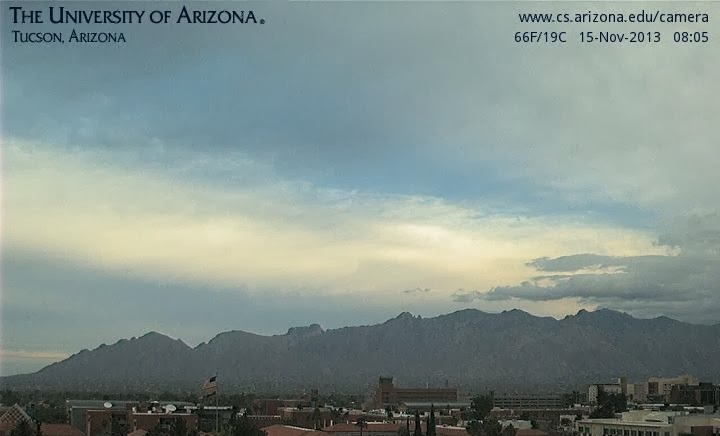 As per Jack's comment, it appears that the NWS Offices are beginning to highlight the possibility of unusually heavy rains with the coming event. 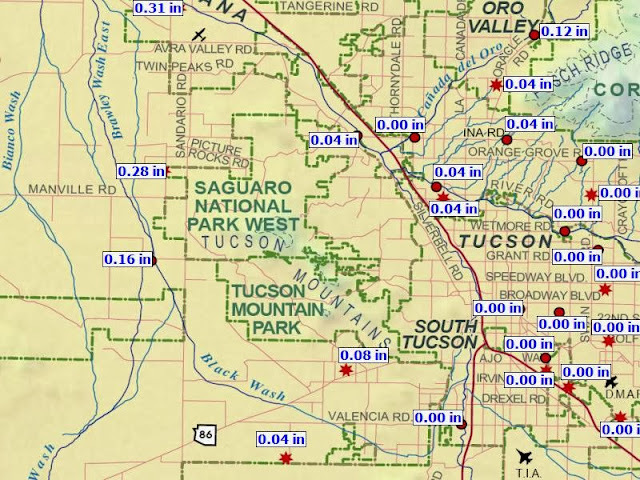 The office here at Tucson has just posted the graphic below illustrating past records for November in this part of the state. 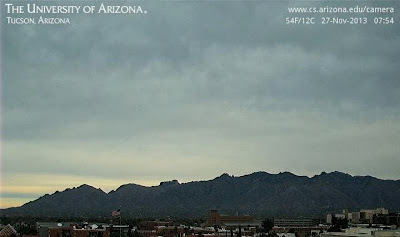 The potential for a significant precipitation event across most of Arizona continues to increase. I can put the developing event in perspective by noting the following. Here at the house there have been, to date, only two events that produced half an inch or more rainfall during all of 2013. On September 6th a direct hit by a small thunderstorm cell produced 0.66" in less than an hour. Back on February 20th a winter storm system provided an event with 0.63" of rain and snow here. That is it for the year so far. The NAM forecast of the 500 mb level valid at 12 UTC next Saturday morning (November 23rd) is shown above. The pattern has evolved pretty much as the ECMWF forecast at long ranges - see post from last Saturday morning the 16th. The models at this time continue to forecast that this will be a fairly warm closed low with thickness values not dropping anywhere near "snow" values at low elevations in Arizona. Note the low over the Southwest is "blocked" into place by the amplifying trough over the Great Lakes, so its movement will be quite slow. The NAM model's forecast of total precipitation valid through midnight on Friday night is shown below, with a significant area of heavy rainfall centered over Arizona. Forecasts from the early run of Atmo's WRF-NAM at midnight last night are shown above and below. The forecast above (both show total precipitation through midnight Friday) on the 5.4 km grid is similar to that from the NAM, with the main difference being the shift northward into Utah of the heaviest precipitation. 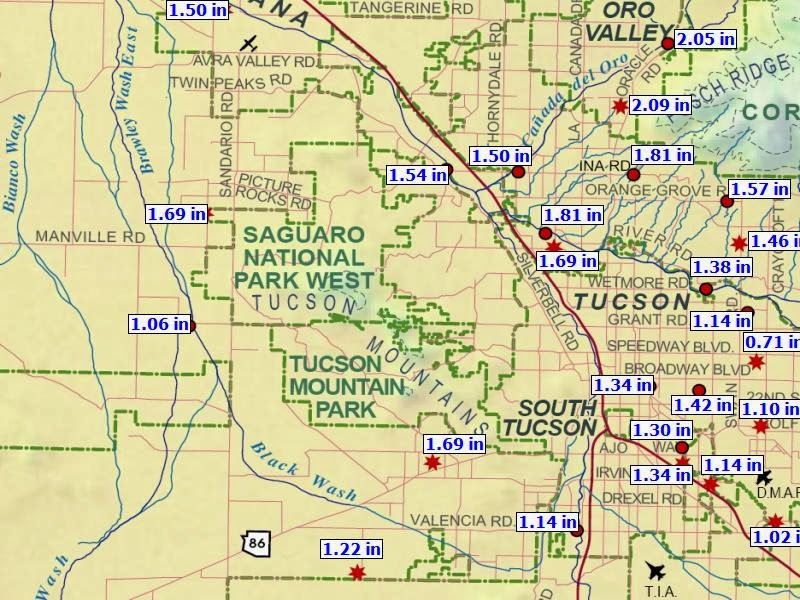 The high resolution 1.8 km version (below) forecasts quite heavy amounts in central and southern Arizona, with amounts of 1 inch or more over a fairly large area. at htis time the 1.8 WRF is maximizing the event over southern Arizona - but this is of course still a couple of days away. The event will not be over at midnight Friday either - it's just as far out as the current WRF forecasts cover. So, the most interesting weather event in many months will be unfolding as the weekend approaches. Art Douglas sent the graphic above of SST from the 17th and pointed out that sea surface temperatures in the GoC remain quite warm for this time of year. Thus, the developing weather system may be able to pick up decent low-level moisture from the south. Indeed, the early WRF-NAM forecast from Atmo this morning indicates PW increasing to around an inch by 11 pm Thursday night the 21st (below). The model forecasts precipitation just beginning across much of Pima County at that time. A look at the GFS ensembles from last evening shows that 11 of 12 members forecast precipitation for southern Arizona during the Friday to Saturday time frame. So, it looks like the best chance for some meaningful precipitation in quite a long while. 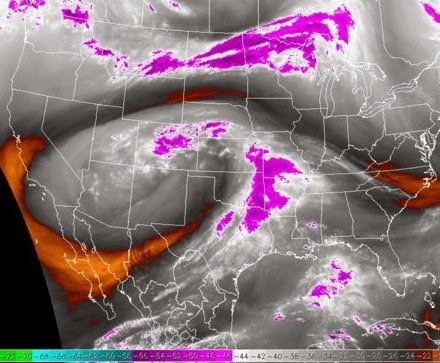 The situation will likely be complicated by a strong cold front and high pressure that is forecast to plunge south over the Plains and Front Range. The forecasts above and below are the surface and thickness patterns from the ECMWF and GFS valid at 5 pm MST Friday afternoon. So it appears that this front will back-door into southeastern Arizona with easterly, downslope winds. This will add complications to the weather event and we'll just have to watch closely to see how all this evolves. 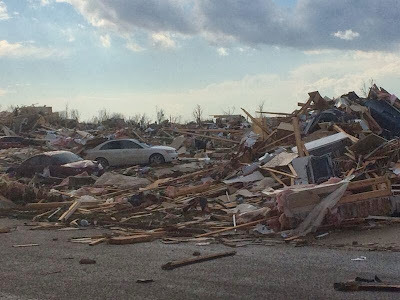 Yesterday's severe storm outbreak produced destructive tornadoes and a number of fatalities, particularly in Illinois. The 13 UTC Outlook issued by the SPC (above) is shown with preliminary severe thunderstorm and tornado reports superposed. Very well-done for the moderate and high risk areas! Edited at 2:50 pm MST - Numerous tornadoes have occurred in Illinois this afternoon. 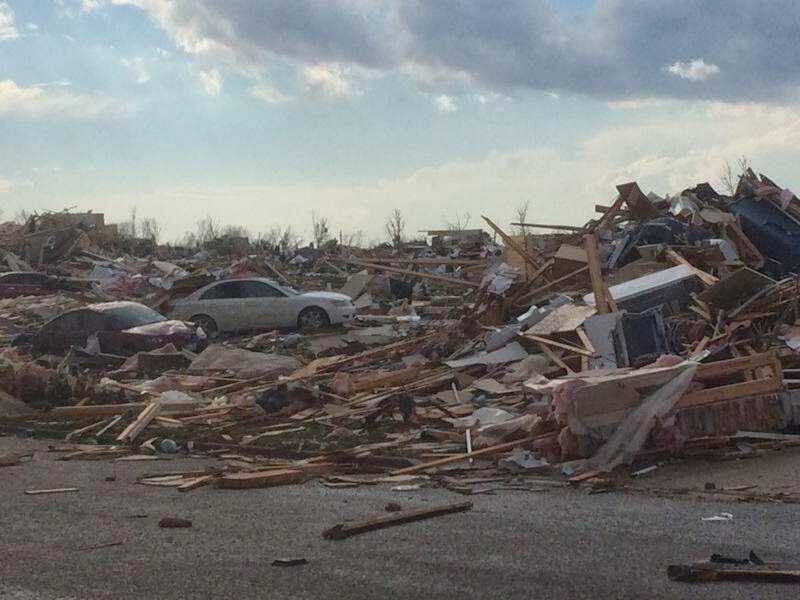 Photo above shows destruction in town of Washington, Illinois. The SPC has issued an outlook for a High Risk of severe thunderstorms today as a strong surface cyclone develops into the northern Great Lakes. The situation is unusual, given how far north the threat has developed. Shown below are this morning's skewT plot and hodograph from Salem, Illinois. Part of the text of the public statement issued by SPC is included at the bottom of this post. Michigan early tonight and western Quebec Monday morning. 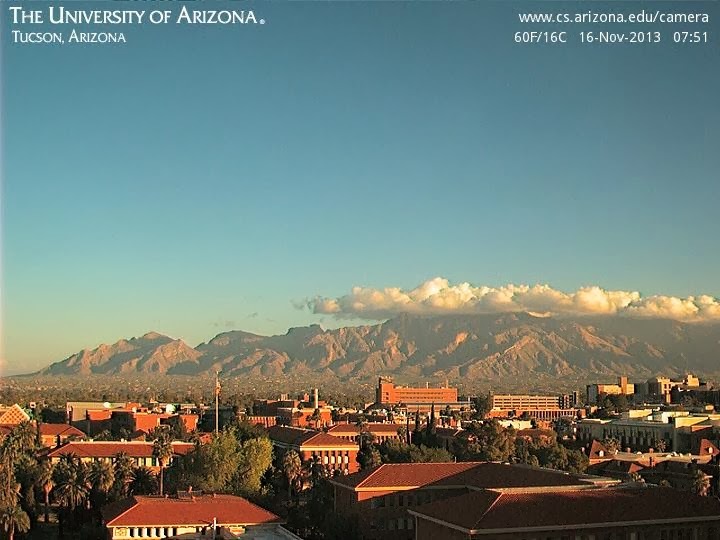 View above shows some cumulus hugging the Catalinas this morning. Yesterday was characterized mostly by heavy cloud cover and gusty afternoon winds. Most locations had gusts in the 30 to 40+ mph range, although on the north side of town it was not as windy. I estimate winds of 20 to 25 mph here, and that's similar to the observations at the Saguaro RAWS station. Strongest gusts I noticed when I parsed through the observations were at Ft. Huachuca, where the maximum reached 47 mph. Four ALERT stations, in the eastern Catalinas and Redington Pass measured rainfall. All-in-all the early WRF forecasts from Atmo verified quite well. Heavy high clouds, with some middle-level clouds mixed in, kept temperatures around sunrise in the 60s F. Air is dirty and it is a dreary picture this morning - view of Catalinas above from the Computer Sciences Building. The early forecasts from the WRF-NAM run at Atmo continue to indicate strong south-southwest winds this afternoon. Forecast shown above is valid at 3 pm MST. The model forecast keeps strongest winds out over central Pima County, where clouds break earliest so that there is more heating and deeper mixing. The model also forecasts strong lee-slope winds on east side of Huachuca Mountains, while strongest winds are to the northeast over the Whites and Rim country. Model continues, also, to forecast little in the way of precipitation with this event. Forecast of total precipitation through 6 am MST tomorrow morning (Saturday, November 16th) is shown below. So it goes. Two short waves at 500 mb will be affecting Arizona for the next several days. The first will come by tomorrow afternoon. The early run of the WRF-NAM this morning forecasts some light radar echoes tomorrow afternoon - above is valid at 2 pm on Friday the 15th. However, actual precipitation is forecast to be quite sparse, since the WRF keeps better values of PW to the south in Mexico. Forecast below shows total precipitation through 6 am MST on Saturday morning. The timing of the short wave will be important, since better PW will be close to the south. The one system that brought us some precipitation this month came through with higher PW than the model had forecast - so something to keep an eye on tomorrow. The first short wave pushes the higher PW well south and east so that the system on Sunday may also be moisture-starved. The model does forecast gusty southwest to west winds over most of the Southwest next two afternoons. Forecasts show 10 m winds valid at 4 pm (above on Friday and below on Saturday). So, some of the dust that came in last two days on the strong east winds will be blown back toward New Mexico. Last Cold Morning Of Week?